Lung cancer first line treatment has been directed from the non-specific cytotoxic doublet chemotherapy to the molecular targeted. The major limitation of the targeted therapies still remains the small number of patients positive to gene mutations. Furthermore, the differentiation between second line and maintenance therapy has not been fully clarified and differs in the clinical practice between cancer centers. The authors present a segregation between maintenance treatment and second line and present a possible definition for the term “maintenance” treatment. In addition, cancer cell evolution induces mutations and therefore either targeted therapies or non-specific chemotherapy drugs in many patients become ineffective. In the present work pathways such as epidermal growth factor, anaplastic lymphoma kinase, met proto-oncogene and PI3K are extensively presented and correlated with current chemotherapy treatment. Future, perspectives for targeted treatment are presented based on the current publications and ongoing clinical trials. Although cancer therapeutics has achieved several advances in the treatment of lung cancer patients, lung cancer remains the leading cause of cancer-related mortality. Lung cancers are divided into two histological groups: Non-Small Cell lung Cancers (NSCLC) and Small Cell Lung Cancer (SCLC). In addition, 85% of all lung cancers are categorized as NSCLC  which is further subdivided into adenocarcinoma, squamous cell carcinoma and large cell carcinoma, roughly accounting for almost 80% of the lung tumors . Although lung cancer has been epidemiologically associated largely with cigarette smoking , lifestyle, diet, passive smoking, and occupational exposure have also been found to play contributory roles [4-7]. Disease stage determines the treatment of NSCLC which includes surgery, radiation, platinum-based doublet chemotherapy and recently targeted therapies by interrupting signaling pathways responsible for cell proliferation and survival. Earlier stages of the disease benefit from systemic chemotherapy, which is also therapeutic strategy for stages II and III of NSCLC [8-10]. Besides, early-stage and localized disease treatment are still maintained by surgery. Moreover, according to some studies, palliative chemotherapy or radiation therapy has shown improvements in survival and quality of life measures in patients with advanced and metastatic disease [11, 12]. In general, classical chemotherapy (platinum-doublet, taxanes, gemcitabine, pemetrexed) results in modest efficacy, thus, multimodal therapeutic strategy has become an important treating option for NSCLC patients. In several studies, two or more drug combinations were proven to have superior efficacy but at the expense of added toxicity [13, 14]. Recently, according to the National Cancer Institute Office of Cancer Genomics, enhancement of the understanding of the molecular mechanisms of cancer, acceleration of genomic science and technology development and translation of genomic data to improve cancer prevention, early detection, diagnosis, and treatment are the goals established for the facilitation of personalized cancer medicine . Additionally, until recently the most effective targeted drugs in the management of NSCLC include the epidermal growth factor receptor (EGFR) and the angiogenesis pathway . Erlotinib which targets the EGFR and crizotinib which targets EML4/ALK molecular pathway are the only agents currently approved in the United States as third-line therapy for patients with advanced/metastatic NSCLC . Furthermore, according to Azzoli et al immediate treatment with an alternative single-agent chemotherapy such as pemetrexed in patients with nonsquamous histology, docetaxel in unselected patients, or erlotinib in unselected patients might be considered for NSCLC patients with stable disease or response after four cycles . Among the targeted agents that have undergone evaluation for third-line therapy and beyond are afatinib, apatinib, axitinib, AUY922, pazopanib, sorafenib, sunitinib, and vandetanib . The last decade clinical research is strongly occupied with the identification of mutations and aberrations concerning NSCLC molecular pathways which has enabled a personalized medicine approach to treatment . According to The National Institute of Health (NIH) a biomarker is defined as a characteristic that is objectively measured and evaluated as an indicator of normal biologic processes, pathogenic processes, or pharmacologic responses to a therapeutic intervention . Thus, recent studies have focused their efforts into incorporating tumor genotyping into clinical decision-making. To date, molecular biomarkers such as EGFR, is included as standard care for NSCLC patients and K-ras mutations include an emerging tool in NSCLC therapy [21, 22]. Besides, currently large-scale testing for somatic alterations in proto-oncogene B-Raf (BRAF), phosphatidylinositol-4,5-bisphosphate 3-kinase, catalytic subunit alpha (PIK3CA), human epidermal growth factor receptor 2 (HER2), and anaplastic lymphoma kinase (ALK) is also feasible and impacts therapeutic decisions . As far as gene expression in NSCLC is concerned, the association between COX-2 or p53 overexpression and survival in lung cancer patients has not yet reached a satisfactory clinical interest [24, 25]. Moreover, customizing chemotherapy by histological subtype has been included in researchers' practice such as pemetrexed for nonsquamous tumors  or the addition of a monoclonal antibody to the chemotherapy such as bevacizumab [22, 26] and cetuximab . Despite the development of new chemotherapeutics, NSCLC still has a 5-year survival rate in only 14% implying the need for the continuing research for novel treatments . In the present review, we are focusing on the ongoing research concerning the treatment of NSCLC patients in clinical trials, including the elucidation of molecular biomarkers and the introduction of novel molecular targeted drugs which are being evaluated as monotherapy or in combination with other treatments. IGF-1; insulin growth factor-1, IGF-1R; insulin growth factor receptor-1, EGF; epidermal growth factor, EGFR; epidermal growth factor receptor, VEGF; vascular endothelial growth factor, VEGFR; vascular endothelial growth factor receptor, PI3K; phosphatidylinositide 3-kinase, PTEN; phosphatase and tensin homologue, SHC; Src homology/collagen, SOS; son of sevenless, GRB2; growth factor receptor-bound protein 2, GAP; GTPase activating protein, GDP; guanosine diphosphate, GEF; guanine nucleotide exchange factors, EML4-ALK; echinoderm microtubule-associated protein-like 4 fused with the anaplastic lymphoma kinase, ERK; extracellular signal-regulated kinases, GTP; guanosine trisphate, MEK; mitogen-activated protein kinase, RAF; proto-oncogene serine/threonine-protein kinase, PIP2; phosphatidylinositol 4,5-bisphosphate, PIP3; phosphatidylinositol 3,4,5-triphosphate, RAS; Rat sarcoma, HER2; Human Epidermal Growth Factor Receptor 2. Activation of the growth factors to transmembrane tyrosine kinase receptors finally increases cell growth, proliferation, metabolism and survival. TKI; tyrosine kinase inhibitors, S6K1; 40S ribosomal protein S6 kinase, IRS1/2; insulin receptor substrate, 4E-BP1; 4E binding protein-1, Akt; protein kinase B, mTOR; mammalian target of rapamycin, STRAD; Ste20-like adaptor protein, TSC; tuberous sclerosis complex, AMPK; adenosine mono-phosphate-activated protein kinase, LKB1; liver kinase B1, HGF; hepatocyte growth factor, MET; mesenchymal-epithelial transition factor, Rho; RAS homolog gene family, Rac1; RAS-related C3 botulinum toxin substrate 1, CDC42; cell division cycle 42, Rheb; Ras homolog enriched in brain, MO25; monoclonal antibody, ERBB3; v-erb-b2 erythroblastic leukemia viral oncogene homolog 3. Growth factors when activated trigger the mTOR-signaling pathway finally resulting in increased cell growth, gene transcription and cell proliferation. More specifically, one strategy for the inhibition of EGFR includes EGFR tyrosine kinase inhibitors (TKIs) which target the intracellular tyrosine kinase (TK) domain of EGFR, blocking the downstream signaling of the receptor . EGFR inhibitors include small molecule tyrosine kinase inhibitors (TKIs) such as gefitinib, erlotinib and afatinib and monoclonal antibodies such as cetuximab which have been studied in phase III trials and are currently clinically being used in NSCLC patients. Among these EGFR inhibitors, only erlotinib has been approved in many countries as second-line therapy for advanced NSCLC patients . To date, gefitinib (ZD1839; Iressa) and erlotinib (OSI-774; Tarceva) are the most studied of the EGFR TKIs for the treatment of NSCLC. Several phase II trials  [34, 35] or phase III trials  have favored gefitinib in pretreated patients and even as first line treatment. Indeed, since 2005 several studies included gefitinib monotherapy as first line treatment in untreated NSCLC patients with some efficacy [37-41] or limited results due to interstitial lung disease (ILD) an adverse effect [42, 43]. Although the most common adverse events are skin rash and diarrhea, ILD is a more serious co-morbidity of NSCLC associated with gefitinib and other cancer treatments. ILD-type events that were more common in Asian patients, appeared in overall incidence of approximately 1% in gefitinib recipients participating in clinical trials . A Double-blind, randomized phase II trial conducted from November 2000 to April 2001 in 30 US academic and community oncology centers enrolled 221 patients with either stage IIIB or IV NSCLC for which they had received at least two chemotherapy regimens before gefitinib with results favoring gefitinib . In a single-center experience, reported by Simon et al 2003, (N=183) gefitinib demonstrated clinically significant antitumor activity and provided good palliation in a predominantly pretreated group of patients . In another randomized, double-blind, parallel-group, multicenter phase II trial (N=210), NSCLC patients who were previously treated with one or two chemotherapy regimens (at least one containing platinum) were randomly assigned to receive either 250-mg or 500-mg oral doses of gefitinib once daily, showing clinically meaningful antitumor activity . However, the Iressa Survival Evaluation in Lung Cancer (ISEL), a placebo-controlled phase III study which investigated the effect on survival of gefitinib as second-line or third-line treatment for patients with locally advanced or metastatic NSCLC (N=1692) showed disappointing results . Because of this trial's results, even though gefitinib was the first TKI to be approved in 2003 for the third-line treatment of NSCLC, two years later the US FDA allowed its use only within clinical trials or to patients who had already received a clinical benefit. Furthermore, in phase III trials INTACT 1 and 2 gefitinib either in combination with gemcitabine and cisplatin in chemotherapy-naive patients with advanced NSCLC did not have improved efficacy over gemcitabine and cisplatin alone  or in combination with paclitaxel and carboplatin showed any added benefit in survival, time to progression (TTP) or response rate (RR), when compared with standard chemotherapy alone . Overall, gefitinib therapy has not shown the expected response to unselected patients. Recently several research groups identified EGFR gene mutations as predictive factors for drug sensitivity [48-51]. EGFR mutations have been identified in larger numbers in Asians, women, non-smokers, and patients with adenocarcinoma, groups. It is a fact that, after the Iressa Pan-Asia Study trial (IPAS), based on progression free survival (PFS) results, gefitinib was approved for the treatment of NSCLC with certain EGFR mutations in all lines of therapy identifying the highly gefitinib-sensitive clinical subset . These mutations lead to increased growth factor signaling and confer susceptibility to the inhibitor. Screening for such mutations in lung cancers identifies patients who will have a clinical responsiveness to gefitinib [48, 53]. Since the existence of EGFR gene mutations (exon 19 deletions or the exon 21 L858R) were reported as a predictive factor for sensitivity to EGFR-TKIs, several studies based their research on this conclusion [54, 55]. Indeed, a lot of studies concluded that gefitinib was superior to carboplatin-paclitaxel [56-58] or cisplatin-docetaxel [51, 52] as an initial treatment, that improved PFS and that the presence in the tumor of a mutation of the EGFR gene was a strong predictor of a better outcome with gefitinib. As for erlotinib, it was approved by FDA in 2004, based on the results of the BR21 trial, a phase III international, randmized, double-blind, placebo-controlled trial that compared erlotinib (150 mg daily) plus best supportive care (BSC) with BSC alone in second- and third-line settings in 731 unselected patients with no EGFR mutation testing concluded . Erlotinib as first line treatment when compared with chemotherapy improved Quality of life (QoL)  and conferred a significant PFS  not only in Chinese patients with advanced EGFR mutation-positive NSCLC in OPTIMAL (CTONG-0802), an open-label, randomized phase III trial, but also in European patients in EURTAC, another multicentre, open-label, randomized phase 3 trial . More specifically, in EURTAC trial (NCT00446225) erlotinib was compared with standard chemotherapy for first-line treatment of European patients (N=174) with advanced EGFR-mutation positive NSCLC . Patients received oral erlotinib per day or 3 week cycles of standard intravenous chemotherapy of cisplatin on day 1 plus docetaxel or gemcitabine on days 1 and 8. Their findings strengthened the rationale for routine baseline tissue-based assessment of EGFR mutations in patients with NSCLC and for treatment of mutation-positive patients with EGFR tyrosine-kinase inhibitors. Besides, in recent phase II clinical trials it was suggested that the use of clinical (smoking status) and pathologic (adenocarcinoma) criteria might identify a subgroup of patients with advanced/metastatic NSCLC who can benefit from front-line treatment with erlotinib when mutation testing is not feasible [62, 63]. Even though plenty clinical trials showed good response rates and PFS [64, 65] in NSCLC patients with EGFR mutations, acquired resistance in these patients responsive to EGFR-TKIs is a major clinical problem . Phase III randomized controlled trials of NSCLC EGFR mutated patients receiving EGFR TKIs as front line treatment versus platinum doublets carboplatin and paclitaxel have shown a benefit in response and progression-free survival, but not in overall survival . Thus, EGFR gene mutation currently cannot be considered a reliable biomarker for consistent response in NSCLC. Since gefitinib or erlotinib can provide temporary success only, the need of novel treatments is crucial. To overcome secondary EGFR-TKI resistance, both preclinical and clinical evidence suggest that irreversible TKIs such as afatinib or PF00299804, or combined approaches using multiple kinase inhibition  and vertical inhibition combining small molecules and anti-EGFR antibodies such as cetuximab (chimeric human-mouse anti-EGFR)   seem to be more promising for the near future. More specifically, afatinib an irreversible HER2 kinase inhibitor BIBW 2992, has been evaluated in Phase I studies  . The determination of the maximum-tolerated dose for Phase II (50 mg/day) has been accomplished  and is currently being used in phase II clinical trials  (LUX-Lung clinical trial program). In a recent study by Hirsh et al results from LUX-Lung 1 trial were evaluated concerning symptom and Quality of Life benefit of afatinib in advanced NSCLC patients previously treated with erlotinib or gefitinib. They reported that the addition of afatinib to best supportive care (BSC) significantly improved NSCLC-related symptoms (cough, dyspnea, and pain), fatigue, physical functioning, and Health-Related Quality of Life (HRQoL) and significantly delayed time to deterioration of cough . Afatinib has shown activity in the treatment of patients with advanced lung adenocarcinoma with EGFR mutations, especially in patients with deletion 19 or L858R mutations . In a phase 2b/3 randomised trial (LUX-Lung 1), afatinib versus placebo for NSCLC patients was evaluated, suggesting that afatinib could be benefit for patients with advanced lung adenocarcinoma who have failed at least 12 weeks of previous EGFR TKI treatment . After these studies of afatinib that have shown high RR and PFS in EGFR mutation-positive lung adenocarcinoma, recently the LUX-Lung 3 study reported that afatinib was associated with prolongation of PFS when compared with standard doublet chemotherapy (cisplatin plus pemetrexed) in patients with advanced lung adenocarcinoma and EGFR mutations . 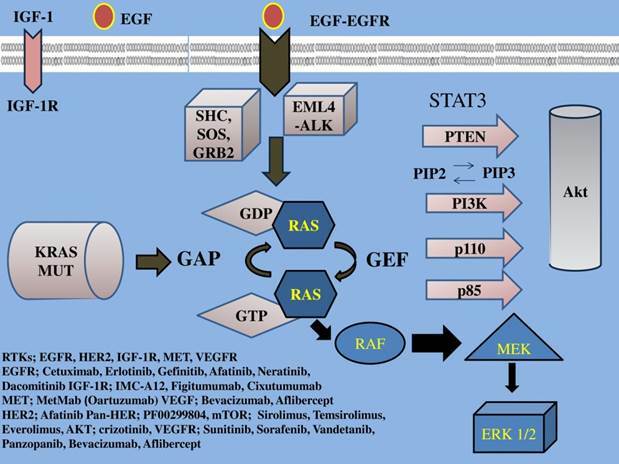 Rossi et al in their review supported also the hypothesis that gefitinib, erlotinib and afatinib are ideal drugs for NSCLC patients carrying EGFR mutations . In addition, according to several phase II and III clinical trials, chemoradiotherapy (CRT) has only extended survival to 18 to 20 months [78-83]. Other clinical trials have investigated the combination of gefitinib and erlotinib with radiation alone or chemoradiotherapy for stage III NSCLC reporting well tolerated and feasible results [84-86]. Results of a phase II study, (cancer and leukemia group B (CALEB) 30106) showed that survival of poor-risk patients with wild type or mutated EGFR receiving sequential CRT with gefitinib was promising where-as survival for good-risk patients receiving concurrent CRT plus gefitinib was disappointing even for tumors with activating EGFR mutations . A prospective study showed that concur-rent EGFR-TKIs with individualized radiotherapy had a favorable safety profile and promising outcome . An Asian study also reported that the combination of first-line TKI therapy with early multi-target radiotherapy were very effective in selected patients that respond to TKI, when the EGFR mutation status are not known before the treatment . A more recently published study, compared the time-to-response between radiothera-py and EGFR-TKIs, concluding that EGFR-TKIs accomplished tumor shrinkage earlier than radiotherapy did in NSCLC patients with a sensitive EGFR mutation, suggesting that EGFR-TKIs might be useful for early symptom improvement in these patients . Other new pharmaceutical agents that bind irreversibly to EGFR tyrosine kinase include neratinib (HKI-272) and dacomitinib (PF-00299804) which have been evaluated in phase II clinical trials  . Sequist et al that studied neratinib to overcome T790M resistance mutation reported responses in G719X EGFR mutation, supporting the need of genetic information on trials of targeted agents . According to Ramalingam et al, dacomitinib demonstrated significantly improved PFS versus erlotinib, with acceptable toxicity . Moreover, cetuximab (marketed as Erbitux®; Dako, Copenhagen, Denmark) is a 152 kDa chimeric monoclonal antibody of the immunoglobulin G1 subclass produced in mammalian cell culture by mouse myeloma cells . Cetuximab plus gemcitabine/platinum  or plus cisplatin/vinorelbine  has been evaluated in randomized phase II clinical trials as first-line therapy with promising results in unselected NSCLC patients. However in a multicenter, open-label, phase III study of 676 chemotherapy-naïve NSCLC patients, paclitaxel or docetaxel and carboplatin, with or without cetuximab were evaluated as first-line treatment, resulting in no notable differences between them . Analysis of potential predictive markers of cetuximab benefit of this phase III trial reported that efficacy parameters did not appear to correlate with K-ras mutation status or any of the EGFR-related biomarkers evaluated . In contrast, Hirsch et al in their study were the first to suggest that EGFR gene copy number detected by fluorescent in situ hybridization (FISH) is a predictive factor for selection of NSCLC patients for cetuximab plus chemotherapy . In another multinational, multicentre, open-label, phase III trial, (FLEX study) chemotherapy-naive patients (>or=18 years) with advanced EGFR-expressing histologically or cytologically proven stage wet IIIB or stage IV NSCLC were randomly assigned in a 1:1 ratio to chemotherapy plus cetuximab or just chemotherapy . The FLEX study reported that overall and median survival rates were also higher in the chemotherapy plus cetuximab group as compared to the chemotherapy alone group in patients with high EGFR expression . Other studies have also favored cetuximab in NSCLC patients. In an open label phase II clinical trial in pretreated NSCLC patients, cetuximab was evaluated as monotherapy resulting in disease control rates and OS comparable to that of pemetrexed, docetaxel, and erlotinib in similar groups of patients . Lin et al in a meta-analysis of four trials enrolling 2018 previously untreated NSCLC patients, showed that the addition of cetuximab to chemotherapy improved OS and overall response rate (ORR) . Overall, as most studies have reported, cetuximab can offer a clinical benefit in NSCLC patients but warrants further investigation. Recently, acquired resistance to TKIs has been reported to include mechanisms such as secondary mutation of the EGFR gene, amplification of the MET gene, and overexpression of hepatocyte growth factor (HGF) . 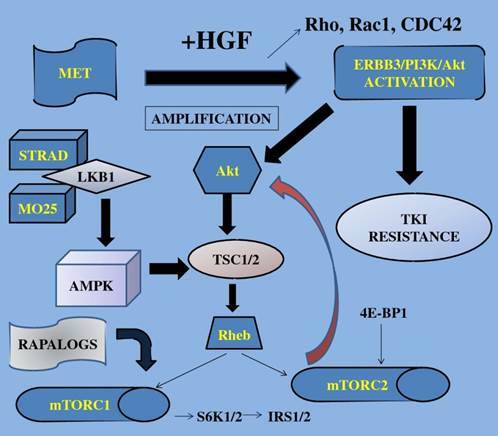 Met is the tyrosine kinase (TK) receptor of the HGF and has been associated with a worse prognosis in NSCLC, activating the ERBB3/PI3K/AKT and GRB2-associated binding protein 1(GAB1) signaling in EGFR-mutant lung cancers . According to Ma et al the Met/HGF pathway is functional and often mutated in SCLC and NSCLC (53). MetMAb (Oartuzumab) is a monovalent monoclonal antibody (MoAb), a promising agent to overcome this resistance. A completed phase II study with results included the combination of MetMAb with erlotinib in patients with advanced and previously treated NSCLC patients improving PFS and OS in those patients whose tumors overexpressed Met by immunohistochemistry (IHC; 'Met high') . After these encouraging results, a similar phase III clinical trial has been launched since 2011 to evaluate the efficacy and safety of MetMab and is still recruiting patients. Other ongoing randomized, phase II, multicenter, double-blind, placebo-controlled studies are investigating MetMab in combination with paclitaxel plus cisplatin/carboplatin (NCT00854308) and in combination with bevacizumab plus platinum plus paclitaxel/pemetrexed plus platinum as first-line treatment (NCT01496742), both in untreated non-squamous NSCLC patients (http://www.clinicaltrials.gov/ct2/results?term=MetMAb+NSCLC&Search=Search). Tivantinib (ARQ 197), a selective, oral, non-ATP-competitive, small-molecule inhibitor of the MET receptor tyrosine kinase was evaluated in a phase 1 dose-escalation trial  or in combination with erlotinib  showing good tolerability and encouraging clinical activity. Recently, studies have been designed such as MARQUEE, a phase III trial to evaluate the combination of ARQ 197 plus erlotinib versus placebo plus erlotinib in treated nonsquamous, NSCLC previously patients  based on the available evidence that dual inhibition of MET and EGFR might overcome resistance to EGFR inhibitors. Another emerging tool for the implementation of personalized medicine includes the K-ras gene mutation. The K-ras gene functions in the downstream domain of EGFR-induced cell signaling by encoding a 21-kDa G-protein with GTPase activity and has a mutation frequency of 3-35% in lung cancer [106, 107]. In particular, K-ras mutations have been found in approximately 17% of all NSCLC, and are seen in 27%-34% of adenocarcinomas and non-squamous tumors, but are rarely seen in squamous cell carcinomas [108, 109]. These mutations are located at codons 12 and 13 and rarely at codons 59 and 61 . Moreover, a meta-analysis of studies in advanced NSCLC provided empirical evidence that K-ras mutations are highly specific negative predictors of response (de-novo resistance) to single-agent EGFR TKIs . Other groups reported that the clinical usefulness of K-ras mutation as a selection marker either for EGFR-TKIs or cetuximab sensitivity in NSCLC is limited  . In a French prospective cohort (ERMETIC project--part 2) by Cadranel et al  in NSCLC patients treated by erlotinib, was reported that EGFR and K-ras status independently impact outcomes in advanced NSCLC patients treated with EGFR-TKI. However, EGFR status impacts both PFS and OS, whereas K-ras only impacts OS. These findings supported the nationwide use of EGFR status for patient selection before EGFR-TKI therapy. Although there are some studies in the literature investigating the EGFR and K-ras mutations in NSCLC tumor samples simultaneously , the role of K-ras mutations remains to be elucidated. Overall, all these data suggest the possible existence of two different molecular pathways one associated (K-ras mutation) and another not associated with smoking (EGFR mutation). The PI3K/AKT/mTOR pathway is also being investigated via inhibited targeted agents in the setting of pathway-activating mutations and for their ability to restore sensitivity to upstream signaling targeted agents . Drugs interfering with the mTOR pathway include rapamycin (sirolimus), and its derivatives cell cycle inhibitor (CCI)-779 (temsirolimus) and RAD001 (everolimus)  which have been investigated in phase I and II clinical trials. Although mTOR inhibitors such as everolimus in combination with EGFR inhibitors appear to be well tolerated, with some evidence suggesting antitumor activity , optimization of the therapeutic impact of mTOR inhibitors in NSCLC will be further defined when reliable predictive factors are identified. The most recent study conducted by Ramalingam et al  included a phase II trial of docetaxel in combination with everolimus for salvage therapy of NSCLC patients with relatively modest efficacy in this unselected population. Furthermore, since EGFR-TKIs therapy includes primary or acquired resistance, a preclinical study in NSCLC lines concluded that the use of everolimus might enhance the efficacy of gefitinib in EGFR-TKI-resistant patients . Besides another study indicated that transient blockade of PI3K/Akt pathway might overcome EGFR TKIs resistance and restore sensitivity to agents well tolerated, thereby providing clinical benefit in NSCLC patients . The PI3K/AKT/mTOR pathway includes Akt, one of the most frequently activated protein kinases in human cancer . Overall, mTOR pathway currently can only be considered for second or third-line treatment [118, 121]. More biomarkers and novel biological agents are required to be tested in clinical trials for mTOR pathway to play a crucial role in NSCLC therapy in the future . The investigation for other genetic abnormalities has led to the identification of anaplastic lymphoma kinase (ALK) gene rearrangements which occurs independently of EGFR and KRAS gene mutations. This genetic change is consisted in a chromosome 2 inversion leading to a fusion with the echinoderm microtubule-associated protein like 4 (EML4) gene, which results in the abnormal expression and activation of this tyrosine kinase in the cytoplasm of cancer cells . EML4-ALK (anaplastic lymphoma kinase) fusion which is a rare abnormality appeared in 4-5% of NSCLC patients  is most common in adenocarcinomas and never or light smokers [125, 126]. In pretreated NSCLC patients that carry the ALK-translocation, Met and ALK inhibitor crizotinib (PF- 02341066) appears to be a favorable treatment option, which significantly can improve activity, efficacy and symptoms control versus chemotherapy . Crizotinib showed good tolerability with rapid, durable responses in the first-in-man phase I study for patients with EML4-ALK fusion . In another phase 1-2 study crizotinib was well tolerated and highly active in patients with advanced ALK-rearranged NSCLC . At present phase III clinical trials (NCT01639001) evaluate the efficacy and safety of crizotinib versus pemetrexed/cisplatin or pemetrexed/carboplatin in previously untreated East Asian patients with non-squamous carcinoma of the lung harboring a translocation or inversion event involving the ALK Gene Locus. Based on these results and those from an ongoing phase II trial (NCT00932451), crizotinib has received accelerated approval in the USA . However, the evaluation of crizotinib in combination with other therapeutic modalities including ionizing radiation remains to be investigated, since resistance to crizotinib might also be a fact . Also, an interesting conclusion in vitro was reported recently in a study that crizotinib overcame hepatocyte growth factor-mediated resistance to gefitinib in EGFR-mutant non-small-cell lung cancer cells . Another important signaling pathway in NSCLC includes type I insulin-like growth factor receptor (IGF-1R)  which is a heterotetrameric receptor (two extracellular 125-kDa α chains and two transmembrane 95-kDa β chains) that auto-phosphorylates after ligand binding and activates other downstream signaling pathways such as PI3K and MAPK . IGF-1R-targeted agents include monoclonal antibodies such as cixutumumab (IMC-A12), figitumumab (CP-751,871), AMG-479, AVE1642, BIIB022, dalotuzumab (MK-0646), and robatumumab (Sch717454), the ligand neutralizing antibody Medi-573, and the small molecule inhibitors BMS-754807, linsitinib (OSI-906), XL228, and AXL1717. Since IGF-1R and EGFR appear to be similar receptors in their signaling mechanisms, there is a possibility that IGF-1R signaling might be involved in tumor resistance to EGFR-TKIs as suggested in several studies in vitro  . Based on this possibility, several trials have been designed such as the combinations of erlotinib with cixutumumab  or figitumumab combined with carboplatin and paclitaxel , all reported very limited results. Given the unsatisfactory results further development of this combination in unselected patients is not recommended. However, the identification of elevated baseline free IGF-1 levels in patients with longer PFS than in those with lower levels in several studies [134, 136-139] might represent a potential biomarker for optimal patient preselection for IGF-1R inhibitors in the future. Plenty of studies revealed the superiority of gefitinib versus platinum-based and docetaxel chemotherapies. However, some of the following studies were conducted in unselected patients, thus precluding a true analysis of the real efficacy of targeted therapy in EGFR patients. Some study groups have compared gefitinib to docetaxel as second-line therapy in pre-treated patients with at least one prior chemotherapy regimen (platinum- or taxane-based) for advanced/metastatic NSCLC . The majority of the studies concluded similar or superior efficacy for gefitinib compared with docetaxel, supporting gefitinib as an effective treatment in NSCLC [141-145]. (Table 2.) Herein, we summarize, the high lightened studies that have reported results concerning the comparison between EGFR TKIs and docetaxel. Combination of targeted agents in NSCLC. In the largest phase III INTEREST trial, 1.466 pretreated patients with advanced NSCLC were randomly assigned to receive gefitinib or docetaxel . They suggested that gefitinib is a valid treatment for these pretreated patients. Two years later, other researchers from the same institute, prospectively analyzed available tumor biopsies of these NSCLC patients, to investigate the relationship between biomarkers and clinical outcomes . They suggested that gefitinib can provide similar OS to docetaxel in patients across a broad range of clinical subgroups and that EGFR biomarkers such as mutation status may additionally identify which patients are likely to gain greatest PFS and ORR benefit from gefitinib. Another international randomised multicentre, open-label, phase III study (TITAN-NCT00556322) which was conducted at 77 sites in 24 countries assessed the efficacy and safety of erlotinib versus chemotherapy in second-line treatment of NSCLC patients (N=2590). Although no significant differences in efficacy were noted between patients treated with erlotinib and those treated with docetaxel or pemetrexed, the toxicity profiles of erlotinib and chemotherapy differed. Therefore, they concluded that second-line treatment decisions should take into account patient preference and specific toxicity risk profiles . A cost-effectiveness analysis was conducted which concluded that costs and effectiveness in patients who received second-line erlotinib compared with those who received docetaxel were equal . They also suggested that the choice of whether to use erlotinib or docetaxel should be based on factors relating to patient preference. Besides, another study by Krawczyk et al (N=204) suggested that the qualification of docetaxel or erlotinib for second-line therapy should be based on clinical and molecular predictive factors . Recently several studies have compared the efficacies of gefitinib and erlotinib as potent EGFR TKIs with antitumor activity in NSCLC patients . In a randomized, single-center, non-comparative phase II trial, by Kim et al the efficacy and safety of gefitinib and erlotinib was evaluated as second-line therapy for advanced NSCLC (N=96) with promising results for both of them . In a taiwanese retrospective multicenter study (N=1122) was reported that patients treated with erlotinib showed higher disease control rate, longer PFS, and OS compared with patients treated with gefitinib . Shao et al compared the efficacies of gefitinib and erlotinib as third-line therapy for advanced non-small-cell lung cancer inTaiwan (N=984) resulting in similar efficacies . Recently completed trials involved erlotinib as monotherapy (BR.21 study) after the failure of first-line or second-line chemotherapy  or in combination with standard chemotherapeutic regimens such as carboplatin and paclitaxel  (TRIBUTE trials) for the treatment of NSCLC. TRIBUTE results concluded that never smokers treated with erlotinib and chemotherapy seemed to experience an improvement in survival. Conversely, erlotinib has exhibited overall survival benefits when used as monotherapy (BR.21 study) . EGFR TKIs gefitinib and erlotinib have also been studied versus other inhibitors and other chemotherapeutics regimens. Natale et al  in a two-part phase II study, compared the efficacy and safety of vandetanib a once-daily oral inhibitor of VEGFR, with that of gefitinib, (N = 168). The primary efficacy objective was achieved, with vandetanib demonstrating a significant prolongation of PFS versus gefitinib. Furthermore, Hong et al  compared the efficacy and safety of pemetrexed, gefitinib, and erlotinib administration in previously treated patients with NSCLC. The superior PFS and OS of EGFR TKIs with more favorable baseline clinical characteristics than those of pemetrexed suggested the impact of baseline clinicopathological factors. In a systematic review of 28 trials with a total of 6171 NSCLC patients and 30 treatments arms, they found that there was a significant relationship between Response Rate (RR) and Median Survival Time (MST) in these clinical trials with EFGR-TKIs by using a linear progression model . They suggested that RR could be an independent surrogate marker for MST in the current response criteria in the clinical trials of gefitinib and erlotinib. Overall, gefitinib and erlotinib appear to show a lot of similarities in NSCLC treatment and no superiority is obvious. Several efforts have been made towards the evaluation of the activity and toxicity profile of gefitinib in NSCLC patients aged 70 years or older. Since 2004, several studies reported that gefitinib is safe and well tolerated in elderly pretreated NSCLC patients   . Furthermore, in a phase II Simon et al reported that docetaxel (75 mg/m(2) every 3 weeks) combined with gefitinib (250 mg orally, daily) is active and well tolerated in elderly patients . However, in studies of Stinchcombe et al in a phase I/II trial of weekly docetaxel and gefitinib in these patients with stage IIIB/IV NSCLC, unexpected toxicity was observed [165, 166]. A phase II, open-label, parallel-group study compared gefitinib with vinorelbine in chemotherapy-naïve elderly patients with advanced NSCLC was conducted by Crinò et al . They reported no statistical difference between gefitinib and vinorelbine in efficacy in these patients, but there was better tolerability with gefitinib. Finally studies to verify safety and efficacy of first-line treatment with gefitinib in elderly patients having advanced NSCLC with promising results were reported by Maemondo et al and Ebi et al [168, 169]. In addition, erlotinib was evaluated mostly in phase II clinical trials in vulnerable elderly NSCLC patients with feasible results  [166, 171-173]. In particular, the GFPC 0505 study a multicenter phase II randomized trial of gemcitabine followed by erlotinib at progression, versus the reverse sequence, in vulnerable elderly patients with advanced NSCLC selected with a comprehensive geriatric assessment (the GFPC 0505 study) was reported that both strategies were feasible but had modest efficacy . Moreover, Wheatley-Price et al  analyzed the influence of age on outcomes in National Cancer Institute of Canada Clinical Trials Group Study BR.21. They reported that elderly patients treated with erlotinib gain similar survival and QoL benefits as younger patients but experience greater toxicity. Bevacizumab is a recombinant humanized monoclonal antibody (MoAb) that binds to and neutralizes human vascular endothelial growth factor (VEGF) . The first trial to establish the combination of bevacizumab and cytotoxic chemotherapy as a new standard of care for eligible NSCLC patients was ECOG  resulting in significant survival benefit with the risk of increased treatment-related deaths. Another study (JO19907) demonstrated that the addition of bevacizumab to first-line carboplatin-paclitaxel significantly improved PFS in Japa-nese patients with advanced non-squamous NSCLC . A Phase III trial (AVAil) of cisplatin plus gemcitabine with either placebo or bevacizumab as first-line therapy for nonsquamous NSCLC significantly improved PFS and ORR . Recently, an open randomized clinical trial (WJOG 5910L) has been designed to evaluate whether the addition of bevacizumab to docetaxel alone (the standard second-line treatment for NSCLC) might improve PFS when administered as second-line treatment in NSCLC patients who have progressed after first-line treatment with bevacizumab plus a platinum based doublet . Approvals for bevacizumab, were based upon the results of the two large phase III studies the North American Eastern Cooperative Oncology Group (ECOG) 4599  and the European AVAiL  concerning the improvement in RR and PFS. Overall, bevacizumab plus platinum-based chemotherapy offers clinical benefit for bevacizumab-eligible patients with advanced NSCLC. As a result to the exciting role of bevacizumab in NSCLC, other anti-angiogenic agents, including small molecule TKIs targeting the vascular endothelial growth factor receptor (VEGFR) have developed and are currently being explored. The latest goal of the researchers is the evaluation of antiangiogenics in combination with radiotherapy. Data do not support the combination of bevacizumab and radiation . Aflibercept a recombinant human fusion protein targeting the VEGF is either well tolerated in phase II trials with platinum- and erlotinib-resistant lung adenocarcinoma  or disappointing results in phase III clinical trials  in nonsquamous NSCLC patients. In a phase III trial that investigated OS for sunitinib, a VEGFR TKI plus erlotinib versus placebo plus erlotinib in patients with refractory NSCLC, concluded that the combination of sunitinib plus erlotinib was associated with a statistically significantly longer PFS and greater ORR . Another VEGFR TKI, sorafenib inhibits the Ras/Raf pathway, which is overactive in cancer patients with a K-ras mutation, showed relevant clinical activity in a phase II study . However, a Phase III, randomized, double-blind, placebo-controlled trial of gemcitabine/cisplatin alone or with sorafenib for the first-line treatment of advanced, nonsquamous NSCLC did not meet its primary end point of improved OS . Furthermore, Motesanib is a selective oral inhibitor of VEGF receptors-1, 2, and 3, platelet-derived growth factor receptor (PDGFR) that showed encouraging results in a phase II trial  in combination with carboplatin/paclitaxel as frontline therapy in NSCLC which led to the development of the MONET1 study. However, this phase III trial failed to achieve its primary endpoint of OS when adding a VEGFR TKI to first-line chemotherapy . Additionally, Vandetanib (AstraZeneca, Macclesfield, UK, ZACTIMA™ ZD6474) is a once-daily oral anticancer drug, a dual inhibitor of vascular endothelial growth factor receptor (VEGFR) and epidermal growth factor receptor(EGFR) signaling [191, 192]. Phase I  and Phase II studies have favored vandetanib in pre-treated NSCLC patients plus docetaxel (ZODIAC) , versus gefitinib, as monotherapy  or as first line treatment alone or with paclitaxel and carboplatin . Recently, after these encouranging data, phase III have been initiated including vandetanib plus pemetrexed for the second-line treatment  resulting in acceptable safety profile. However, in other phase III trials vandetanib was evaluated versus erlotinib  or versus placebo (ZEPHYR)  in pretreated patients with disappointing results. Overall, except for bevacizumab, the part of other agents targeting VEGFR that are under clinical development is still limited today since several issues such as predictive biomarkers of response to antiangiogenic therapy and mechanisms of resistance to these agents remain to be elucidated. The current practice of first-line therapy for advanced NSCLC is four to six cycles of platinum-based combination chemotherapy followed by treatment break in non-progressive status . Moreover, only approximately 60% of patients would experience disease control at 8 weeks  and the median OS observed in recent trials of platinum-based double-agent chemotherapy has been 10 to 13 months [201, 202]. Therefore, researchers have tried to prolong disease control obtained with first-line chemotherapy by additional therapy, in an attempt to improve OS, with preserved QoL. This additional chemotherapy is called maintenance treatment which can be consisted of a drug included in the induction regimen (so-called “continuation” MT) or early introduction of another non-cross-resistant agent (“switch” or consolidation MT) . We performed an electronic clinical trial search through PubMed data base including the following studies that state clearly in their title the application of maintenance treatment in NSCLC patients. (Table 3.) Although until a few years ago, no MT studies have shown an OS benefit, recently several studies have revealed the clinical benefit of maintenance therapy [203, 204]. Agents that have recently been licensed as maintenance therapy for advanced NSCLC by the US Food and Drug Administration include erlotinib and pemetrexed . However this new setting still remains controversial as there is no certainty that maintenance treatment is superior to second or third line therapy . The first agent to be integrated into the treatment regimen was gefitinib, as a MT. Kelly et al in a phase III trial of maintenance gefitinib or placebo after concurrent chemoradiotherapy and docetaxel consolidation in inoperable stage III NSCLC (SWOG S0023, N=243) reported that gefitinib did not improve survival . However, the latest study included a multicentre, double-blind randomised phase 3 trial (INFORM; C-TONG 0804, N=296) reported by Zhang et al . They concluded that MT with gefitinib significantly prolonged PFS when compared with placebo in patients from East Asia with advanced NSCLC who achieved disease control after first-line chemotherapy. Cappuzzo et al designed a phase III, placebo-controlled Sequential Tarceva in Unresectable NSCLC (SATURN; BO18192) study to assess the use of erlotinib as MT in patients with non-progressive disease following first-line platinum-doublet chemotherapy . They reported that MT with erlotinib is well tolerated and significantly prolongs PFS compared with placebo and it could be considered in NSCLC patients who do not progress after four cycles of chemotherapy. Furthermore, recently, Zhang et al  evaluated the efficacy and safety of erlotinib as MT in patients with unresectable NSCLC by evidence-based methodology from six eligible studies including 4372 patients. They reported that erlotinib produced significant clinical benefits with acceptable toxicity as a maintenance strategy in these patients, particularly when sequentially administered with chemotherapy but further suggested the comparison of the efficacy of erlotinib used as MT with second-line treatment. Finally, a phase II study of bevacizumab plus pemetrexed and carboplatin followed by maintenance bevacizumab in patients with advanced, nonsquamous NSCLC was well tolerated and displayed remarkable activity in these patients . Another phase II study of pemetrexed and carboplatin plus bevacizumab with maintenance pemetrexed and bevacizumab as first-line therapy concerning the same group of patients resulted in acceptable toxicity and relatively long survival . After the 6 cycles of platinum chemotherapy, the patient may achieve no response and remain symptomatic or achieve response and become asymptomatic. In the first case, the big question concerns whether the subsequent therapy is “maintenance” or “early second-line therapy”, and in the second case it concerns whether “maintenance therapy” is always better than “watch and wait”. Overall, as the era of personalized therapy is emerging these decisions should be made on the underlying molecular profile of the individual patient. It is evident that combined treatments or not followed by MT of biological agents justify further investigation in NSCLC patients. All targeted agents mentioned in this review are directed toward key components in several signaling pathways. It is a fact that here is an increasing interest in using combinations of targeted agents to inhibit more than one pathway; for example, inhibition of VEGFR + EGFR . Indeed, when dual inhibition was compared with VEGF or EGFR blockade alone, resulted in the reduction of tumor endothelial proliferation . A phase I clinical trial included dual EGFR inhibition in combination with anti-VEGF treatment in NSCLC patients . They concluded that the combination of erlotinib, cetuximab, and bevacizumab was well-tolerated and demonstrated antitumor activity in heavily pretreated NSCLC patients. Similarly, in another phase I study, it was demonstrated that combination therapy with ertotinib plus cetuximab was well tolerated . Additionally, Boutsikou et al in a four-arm Phase III trial in patients with NSCLC reported the administration of bevacizumab and erlotinib in combination with first-line chemotherapy, followed by bevacizumab and erlotinib monotherapy as maintenance . They showed promising results, with reduced toxicity as compared with chemotherapy alone, but there was no longer OS. Moreover, in a double-blind, placebo-controlled, randomised phase III trial (BeTa), addition of bevacizumab to erlotinib did not improve survival in patients with recurrent or refractory NSCLC . Recently, Biomarker-integrated Approaches of Targeted Therapy for Lung Cancer Elimination (BATTLE) trial included the first completed prospective, biopsy-mandated, biomarker-based, adaptively randomized study in 255 pretreated lung cancer patients receiving erlotinib, vandetanib, erlotinib plus bexarotene, or sorafenib . The targeted treatment in this trial was based on relevant molecular biomarkers analyzed in fresh core needle biopsy specimens. They reported an impressive benefit from sorafenib among mutant-Kras patients. It is evident that in the near future, researchers will investigate the majority of the agents in combination with other therapies, either conventional chemotherapy or targeted therapy and even produce multiple pathway inhibitors such as XL 184 (Cabozantinib). XL 184 is a multiple TKIs agent for MET and VEGFR2 which is currently being investigated in several clinical trials either alone or in combination with other agents such as erlotinib (http://www.clinicaltrials.gov/ct2/results?term=XL+184+NSCLC&Search=Search). Apart from identifying the most appropriate combinations in selected NSCLC patient subgroups, the definition of the optimal treatment doses is also crucial for the achievement of the best therapeutic index and perhaps not the performance of large trials in unselected patients. Besides it is also important even in negative trials to identify biomarkers of response although to avoid negative results, researchers need to produce more preclinical and early clinical data before large clinical trials are initiated. Available targeted therapy should be given to patients presenting the target. To date, EGFR TKIs, bevacizumab and ALK inhibitors include the most successful targeted agents in NSCLC. Besides, a few biological agents have shown better response in certain histologic subtypes of NSCLC leading to the involvement of histology to guide therapy. At this point, several novel therapeutic targets are currently being investigated in laboratories and in clinical trials. Furthermore, in order to accelerate the identification of individualized targets, the accomplishment of cheap next-generation sequencing technologies for adequate parts of the genome is at large. In conclusion, a step towards the realization of personalized therapy has been accomplished in NSCLC, concerning the identification of molecular biomarkers. Thus, the therapeutic goal concerns as much possible molecular information for every patient. However, the physician should primarily take into account patient's profile and individual characteristics and of course patient's response to therapy given the multiple subsets of NSCLC each with its own molecular abnormalities.